Info "Finish the ugly painting!" 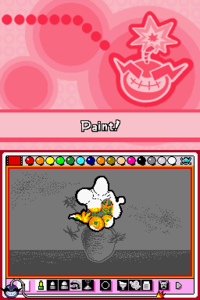 Mario Paint is a microgame found in WarioWare: Touched! in the Retro Action stage. It is set in the SNES game of the same name, Mario Paint. The object is to color in the white pictures by rubbing the stylus on them. However, the size of the pictures can vary; smaller pictures are easier to color within the time limit, while the larger pictures are harder. The player also has eight seconds to finish the pictures as opposed to other microgames' four. Level 1: The player must color in one picture. The picture is either an elephant or flowers. Level 2: The player must color in two pictures. The pictures are either a car and a moon, or the wind god and the thunder god. Level 3: The player must color in three pictures. The pictures are either a fish and two shells or a human head, a boat, and a house. This page was last edited on February 23, 2019, at 18:15.